It is with great pride that the Lehigh Valley Youth Soccer League, in partnership with St. Luke’s University Health Network and Eastern Pennsylvania Youth Soccer, is offering its first LVYSL Coaching Safety Education Summit, a free coaches clinic to educate coaches on all levels regarding safety factors in youth soccer. The event will be held 8 – 10:30 a.m. Saturday, Aug. 18 in Room 113 of the Sally Breidegam Miskiewicz Center for Health Services, Moravian College, 1107 Main Street, Bethlehem, Pa. 18018. St. Luke’s personnel will guide coaches through a program from 8 a.m. until approximately 10:30 a.m. that includes sports performance, common injuries, head injuries, environmental injuries, nutrition and hydration issues, sudden cardiac arrest, developing an emergency action plan in case of injury, along with a coaching sideline etiquette session from Lehigh University men’s soccer coach Dean Koski, and a presentation from sports psychologist Megan Cannon on appropriate post-match speeches. Thanks to a grant from EPYS, 50 coaches can sign up for additional free CPR certification, which will run from 10:30 a.m. until approximately 12 noon. Any teams or clubs with AED’s are asked to bring them to summit for inspection. The summit is limited to the first 200 coaches registering. This is ideal for all coaches, especially those in their first few years of coaching. Go to ttps://bit.ly/2JsyhCV to register. The 39th annual LVYSL Soccer Tournament is still in need of specific age group teams to round out divisions. Please direct any questions to tournament director Gary R. Blockus by emailing info@lvysl.org. Special hotel room rates are available and discount passes for Dorney Park and Wildwater Kingdom will be available shortly. The 39th annual LVYSL Tournament which takes place June 9-10 at Lehigh County Sports Fields in Allentown is still in need of a number of teams to fill out its brackets.. Deadline to register is 11:59 p.m. Sunday, May 6. The tournament is one of the oldest in Pennsylvania and an excellent way to end your 2017/2018 seasonal year or get an early start with your team for 2018/2019. Come be part of the fun and history. Special half-price passes for Dorney Park & Wildwater Kingdom will be available to purchase on the LVYSL website shortly. Special tournament discount rates for area hotels are also available! The tournament is played in the shadows of Dorney Park & Wildwater Kingdom, will feature plenty of after-play activities as well with Bethlehem Steel, the USL affiliate of the Philadelphia Union, hosting Louisville City 5 p.m. on June 9, and Downtown Allentown hosting the family-friendly Brews, Blues and Barbecue noon to 10 p.m. the same day. The event is open to boys and girls teams, ages U9-U19. U9 and U10 will play 7 v. 7, U11 and U12 will play 9 v. 9 and U13 and older will play 11 v. 11. The application fee for teams playing small-sided is $500 while large-sided teams are $575. This is a two-day tournament and all teams are guaranteed three games over the course of the weekend. You can enter the tournament by clicking this link. 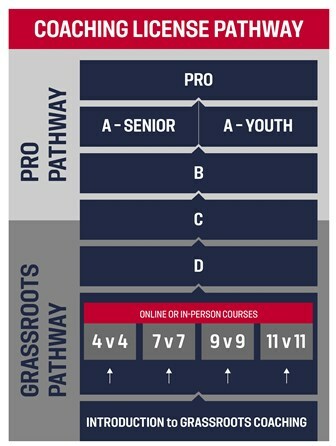 Beginning today, U.S. Soccer will roll out its recently announced Grassroots Coaching pathway initiative with an introductory online coaching education module that any person interested in becoming a soccer coach can take at no cost. The Introduction to Grassroots Coaching Module is now the first step for coaches to progress within the coaching pathway and learn about U.S. Soccer’s coaching education philosophy. The new introductory module, which will take approximately 20 minutes to complete, can be accessed on the U.S. Soccer Digital Coaching Center (DCC) and aligns with the Federation’s ongoing effort to improve the quality of coaches at all levels. Before there was Lance Armstrong, before there was Floyd Landis, U.S. cyclists took part in another doping scandal. Come spend Monday evening a the beautiful Frank Bank Alehouse Cinema at SteelStacks in Bethlehem and find out about the very first doping scandal in U.S. cycling by watching “Tainted Blood: The Untold Story of the 1984 Olympic Doping Scandal,” a documentary by former cyclists Jill Yesko. Seven members of the U.S. cycling team admitted to blood doping at the 1984 Olympic Games to earn the first U.S. Olympic cycling medals since the 1912 Olympics. Local cycling enthusiasts will recognize quite a few of the main characters. Yesko searches hard for the truth, interviewing key players, including athletes, coaches and doctors about the scandal of the controversial practice called blood doping, which cast shadows upon the medals won by U.S. cyclists at the 1984 Los Angeles Olympic Games. Yesko, Dr. Thomas Dickson and other will be on hand for a panel Q&A after the Lehigh Valley premier. On Tuesday at noon, the Lehigh Valley Phantoms announced that they will be hosting the Charlotte Checkers in back-to-back games to kick off their home exhibition season for the 2016-17 American Hockey League season, the Phantoms’ third season playing in Allentown’s PPL Center. KEMPTON — Forget the kid in the candy store. At the annual Lehigh Valley Hunting and Fishing Extravaganza, we put the kids in the outdoors and show them how to have wholesome fun, all the while learning proper outdoor skills and how to be respectful citizens. Bring your children and their friends to the 11th annual Lehigh Valley Hunting and Fishing Extravaganza Aug. 27-28 at the Kempton Fairgrounds in Kempton., Pa. Here, they’ll have a chance to catch their first fish, draw a bow, safely shoot BB guns and air rifles under expert supervision, learn about forestry and meet Smokey Bear, and so much more. Bird dog competition and seminars at Lehigh Valley Hunting & Fishing Extravaganza Aug. 27-28. After these hot August dog days of summer, it’s time to get your dog in gear. Get your pup ready for hunting season at the 6th annual Lehigh Valley Hunting and Fishing Extravaganza Top Dog Challenge 9 a.m. Sunday, Aug. 28 at the Kempton Fairgrounds in Kempton, Pa. The timed bird-finding event is sponsored by Pheasant Valley Farm of Robesonia, Berks County and the LVHFE, and is open to flushers, pointers and retrievers. Trophies are awarded at the completion of the event, and the top three places will receive Cabela’s gift cards. This may be year 11 for the Lehigh Valley Hunting & Fishing Extravaganza, but the Weaknecht 50-Target 3-D Bow Fair surpasses it and then some. Weaknecht’s Bow Fair is one of the big draws to the annual hunting, fishing and everything outdoors show that will be held at the Kempton Fairgrounds 8 a.m.-6 p.m. Saturday Aug. 27 and Sunday,Aug. 28. Bow hunters from miles around will be honing their skills in real-life hunting situations throughout each day in Weaknecht Bow Fair’s challenging 50-target, 3-D Course set up in woodland, hillside, rolling grass field and raised stations.